Johannes Kepler (1571-1630) - German astronomer who postulated the laws of planetary motion, which were later proven correct. Along with his contemporary, Galileo, they were the next two great scientists (chronologically) after Copernicus to advance the scientific revolution. Basically he picked up where Copernicus left off. Copernicus put forth the heliocentric model of the solar system, stating that the earth revolved around the sun, instead of the other way around. Kepler supported this theory in one of his works, Epitome Astronomiae Copernicanae, and expanded on it to include all the planets in addition to our own. His other major works detailing his findings were Astronomia nova and Harmonices mundi. The Astronomia nova is based on his ten years of studying the planet Mars, and the Harmonices mundi contains his Third Law of of Planetary Motion. Kepler was born in southern Germany in the state of Baden-Württemberg. As a six year-old boy he witnessed the Great Comet of 1577 which is said to have sparked his interest in astronomy. As a mathematics student at the University of Tübingen he was introduced to both the Ptolemaic and Copernican models, and properly accepted the Copernican as the correct one. As a scientist, his work didn't attract near the controversy that Galileo's had. For one thing, Germany was a Protestant region and he lived beyond the Pope's authority. And secondly, Kepler himself argued in favor of the Copernican model from a theological perspective. In fact, he attended seminary at Maulbronn and very nearly became a minister. 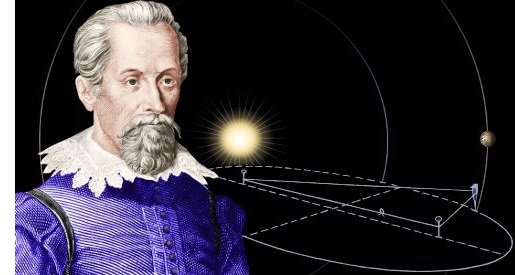 But in 1594 he was offered and accepted a position at the University of Graz as a mathematics and astronomy teacher. Interestingly, as contemporaries, Galileo initially ignored much of Kepler's work. However, in 1610 Galileo made his observation of four of Jupiter's moons and sought Kepler's opinion on his discovery, which Kepler accepted. Unfortunately, though, Galileo never offered a response to Kepler's Astronomia nova, to his disappointment. But the work of those two great astronomers (as well as Copernicus) laid the foundation for the giant leap made by Isaac Newton in the universal laws of motion and gravitation a generation later.